WHEN SHOULD HOOF CARE FOR FOALS BEGIN? Foal trimming should begin at ten days old, as that is when that soft hoof begins to harden and the frog begins to have some profile. Assessment includes observing if the foal has straight legs in front, if the cannon bones are set under the centre of the knees and if the pasterns are in line with the fetlocks. If at this age the front legs are straight that is great, and hopefully mother and foal are in an area that has some wear factor under their footing and Mother Nature can keep those foals hooves trimmed level to ensure that the good straight legs remain that way. For foals which at ten days old do not have straight leg conformation, the hoof wall will have already begun to bend either to the inside or the outside to compensate for this condition. 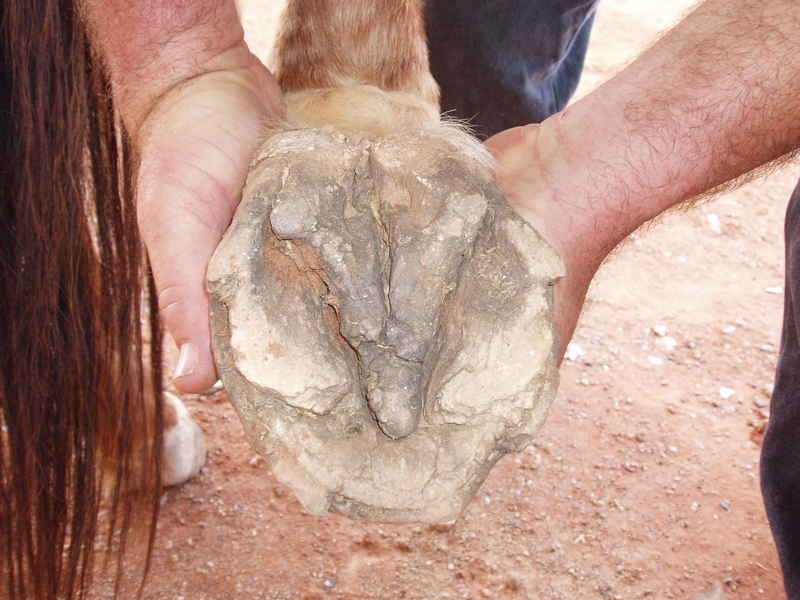 This bend or flare in the hoof wall must be removed so that the leg now stands straight; if it is not corrected at this stage, it will cause the hoof capsule and the lower joints to rotate even more out of line. These foals must then be re-checked monthly to ensure that they have a chance of straightening up in front and a chance of staying that way. A lot of foals’ legs will straighten up naturally as their tendons and ligaments develop strength, however if they are in a soft paddock the bottom of the hoof has to be kept level by us because Nature obviously can’t do it. 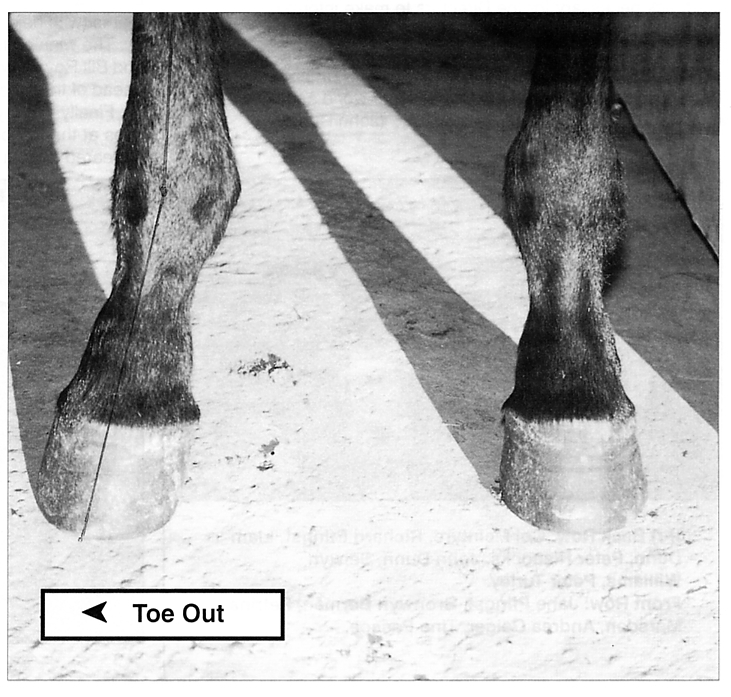 If this ten day inspection is missed, by the time the foal is one month old nearly all of their hoof capsules will have grown forwards and the heel buttresses will have followed, (pic 2) the heel will already be contracted and the tiny hoof will now be narrower at the base than it is at the coronary band. The cause of this is simply that the heels are already too high and the frog has lost its function to expand the heels. Now the hoof must be trimmed, so lower the heels to six millimetres above the junction of the widest part of the frog (pic 3) and dress any flare at the toe. If the hoof is turning out, trim the outside 2/3 of the hoof, or, if the hoof is turning in, trim the inside 2/3 of the hoof. Nearly all young foals will have a tendency to stand toed out in the front legs as well as the hinds during their early stages of life, (pic 4) so their tiny hooves will be flaring to the outside, hence the need to correct the outside 2/3 of all hoof capsules to cause them to stand straight. There is no point in breeding your best mare to the best stallion, waiting 11 months for the foal of your dreams, then not attending to those tiny platforms of performance. With the new season’s foals growing fast, now is an opportune time to get our minds around the subject of training the young horse to be shod. As the breeding and competition standards have become higher over the years, so too has the need to handle our young horses from an earlier age become more important. 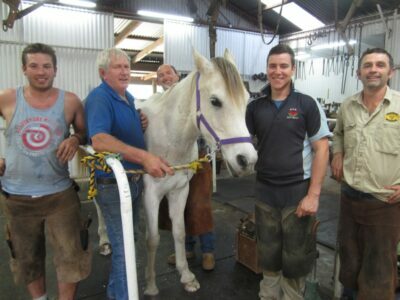 There is plenty of evidence to show us that most bent leg problems in foals can be corrected by careful attention of the farrier from as early as three weeks after birth; at this age the foals are very easy to hold (close to mum of course) and should then be trimmed regularly to establish a pattern. Because these foals are handled regularly from an early age, shoeing is generally not a problem. But what happens to the foal which has perfect legs from birth? The tendency is often to do nothing with this group, until they are weaned at about six months of age and are much stronger and then need to be halter broken, taught to lead, tie up (using a breeching rope) then have the legs handled and hooves trimmed. To avoid this problem, these foals should have been handled continually from three weeks old. I do not condone the use of twitches or leg ropes, especially ear twitches, instead just take a little more time, allow him to learn to balance on three legs, which will give him confidence. They respond so quickly to kindness. Teaching the foal good habits for shoeing is important. Make sure you reward for good behaviour and not for poor behaviour. If a horse is broken in or handled in a logical sequence using the ‘be firm but be fair’ rule, lifting his legs to trim them is never a big deal. The earlier you start a hoof maintenance programme the easier it is also to correct potential leg action problems. Trim only the excess hoof wall length, and only flaky sole and excess bar to achieve a balanced hoof. There should be no flares in the foals hoof wall when correct. Regular monthly maintenance is essential. Bent legs in foals are an agonising problem for all concerned. 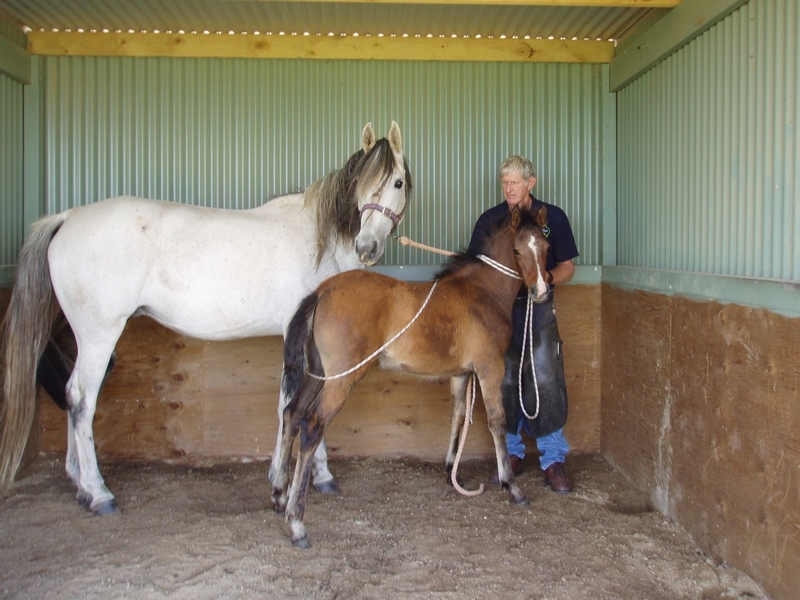 A percentage of bent legs in foals is hereditary and as a result it is my belief that unless previous foals from the blood line have a history of growing out of the problem or have been successfully straightened by either veterinarian or farrier intervention, it is not wise to continue breeding from that line. History has shown that if we start off a young horse with inherent lower-leg problems, it creates a never ending risk of unsoundness, which usually occurs when the horse is at the peak of its performance. They may be kept sound for a short career by good farrier or veterinary attention but is this really fair on the horse? Overweight mares often produce foals with bent legs, usually due to the lack of space in the mare for the foal to develop. However, once on the ground, these nearly always straighten naturally. Despite our efforts, care should be taken to regularly inspect the foal’s lower leg hoof alignment, say weekly, for the first two or three months of its life, as things can still go wrong. As the foal’s hoof begins to harden and the ground dries out, the foal’s body weight increases at the same time and wear on the tiny hoof begins. 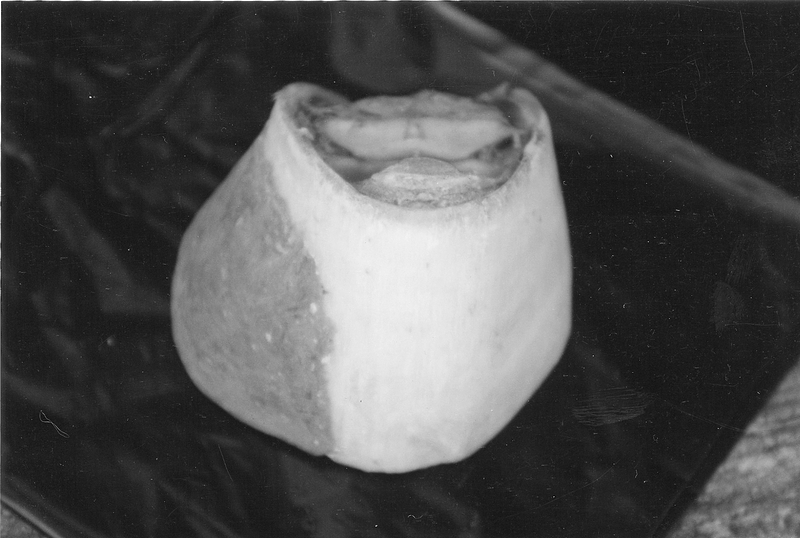 Often, just as this tiny hoof capsule begins to grow any length, one side breaks away. This creates an uneven hoof which unless corrected quickly, will start to turn the foal’s lower leg either inwards or outwards. Correction may be simply a matter of trimming the hoof wall back to level again. Viewed from its front, the rule is that if the foal is pointing his toe in, trim the inside edge. If his toe is pointing out, trim the outside edge; if he is standing too upright, trim the heels, or if he is standing down on his heels, trim the toe. Synthetic hoof materials such as BondNFlex can be used to achieve these corrective measures with a great degree of success. Bonding quickly to the hoof wall without the need for shoes or nails, these synthetic materials can be used to extend the hoof wall in any direction and do not impede the natural development of the hoof and the extension can be reduced in size as the leg straightens. Once bonded, the synthetic material will grow down with the hoof wall and can be trimmed and rasped the same as a normal hoof wall. Stud owners and breeders have now realised the importance of correcting bent legs in their foals as early as possible. Prices at yearling sales reflect this as well as extending the competitive life of their valuable stock. This is without doubt the most important time for a reminder about hoof care in respect to mares and foals, and the old saying that prevention is better than cure comes to the fore. As they approach foaling, mares carry a lot of extra weight and can suffer from hoof abscesses; the greatest majority of these are totally preventable if we just know what to look for. 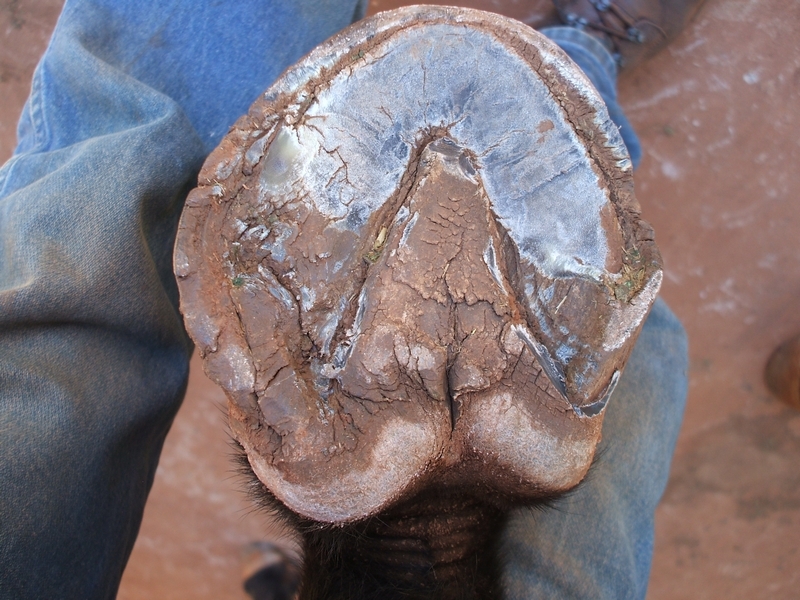 Abscesses occur in predictable places in the hoof, either in the front part of the sole, or the bar area near the heel. Often we make the mistake of just paddock trimming the mares during the year, whereas we should realise that it is extremely important to trim the hoof for soundness whenever it’s done. If when looking at the mare it is standing splay footed in front and cow-hocked behind, it indicates that there are flares on the outside hoof walls. 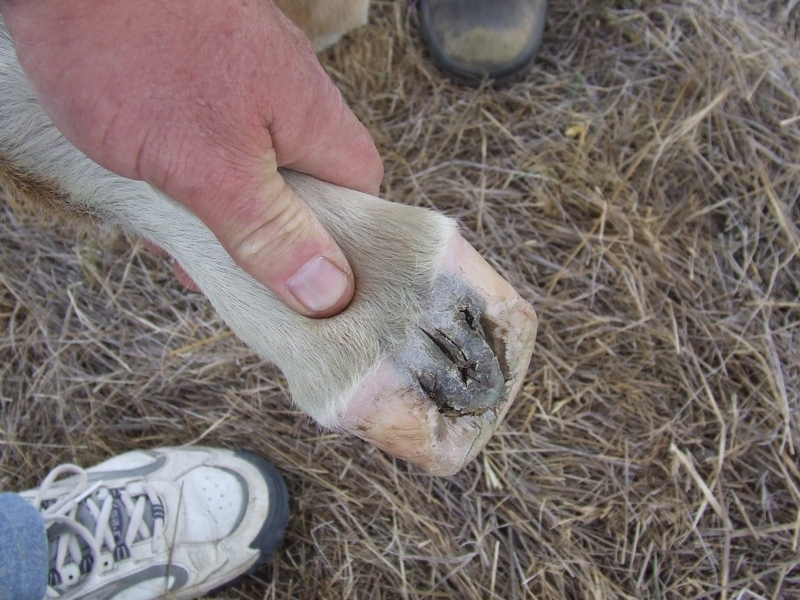 (Pic 2) Flares are the cause of hoof wall separation which leads onto abscesses, which may also interrupt the breeding cycle of the mare just at the wrong time. This is totally preventable by carrying out a good hoof maintenance program all year. 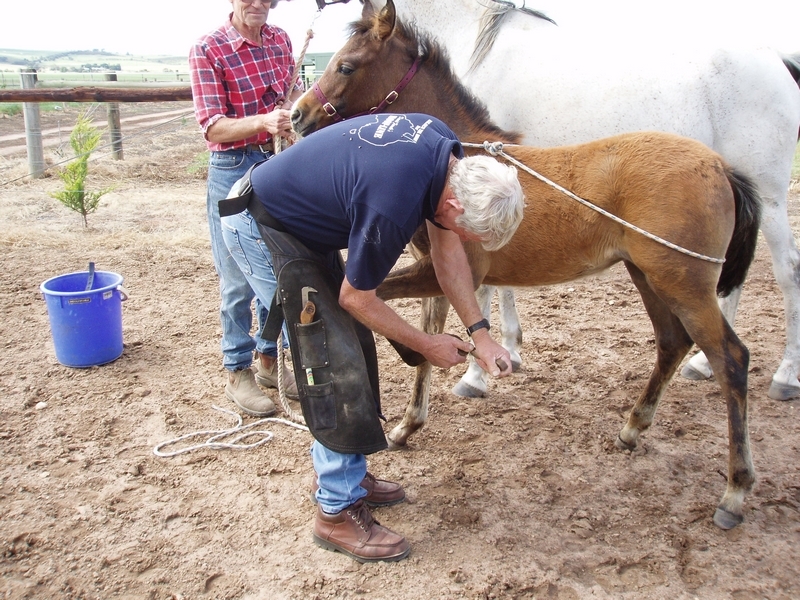 In many cases, early hoof trimming will be successful and beneficial, and for some foals you will need the services of both veterinarian and farrier to ensure a correct outcome. We must realise that the cost of good hoof care is insignificant when the benefits are so critical for the horse. Natural athletic ability is born into all horses: true or false? By the time we get to start training the young horse either on the ground or under saddle, we are sometimes quite convinced that this has to be the clumsiest animal ever bred, while the next one may appear to be totally the opposite. The simple fact is that sadly, by the time many of our young horses are old enough to do anything with, they have had little or no attention by way of corrective hoof trimming, so we begin their education already way behind the eight ball. To avoid this dilemma is really quite simple; we need to start looking at their legs and hooves as early as possible and be able to recognise any irregularities in the alignment of bone structures or crooked feet. We then need to begin to put in place a programme of preventative maintenance to be sure the young horse ends up with straight legs and well balanced hooves. It is all too easy to simply put this task into the too hard basket, and to hope that any problems will just go away, or that the farrier will fix it later, by which time the youngster is then eighteen months or two years old and that little leg deviation is now agonisingly obvious and the hoof is way out of balance. You now have a situation which possibly cannot be corrected by even the most educated veterinarian or farrier and you have effectively wasted the effort of breeding and all the ensuing time. 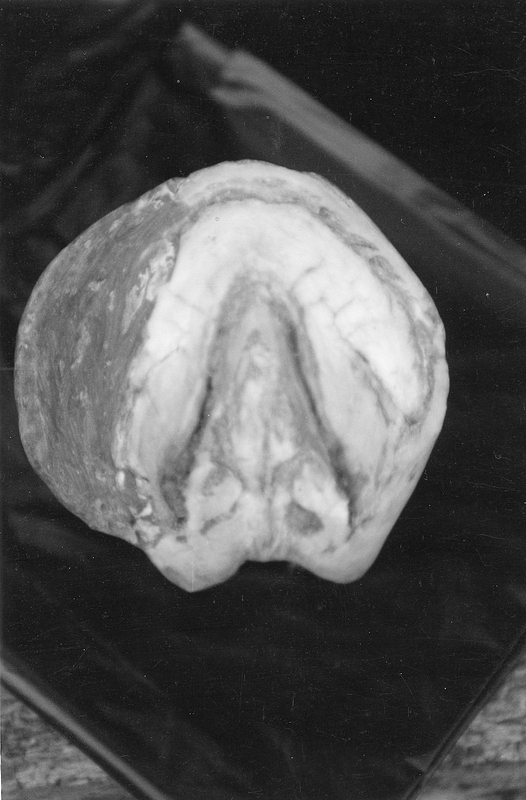 The causes of these leg bone and hoof abnormalities may be genetic, in which case they should be culled out to start with, or it may be the result of a big foal with not enough room to develop in the womb and it may take time to straighten up its legs once it is born, but in the short space of time while the legs are crooked, the hoof capsule starts to bend the wrong way, and that is when they need attention. Many times we see adult horses’ hooves start to grow crooked after an injury to the coronary band/heel area, and unless these are treated properly it can ruin that horse’s future working life. The solution is education which ultimately reduces the fear of early decisions by all concerned with Hoof Care, thus making it possible for the horse owner, trainer, rider or hoof carer to feel comfortable and confident about making the right decisions to improve the outcome for the horse.